In July 2011 a new museum will open on Liverpool’s waterfront. Inside it will tell how a tiny, insignificant fishing village rose to become the pre-eminent port in the world, a centre of industrial innovation, global trade and culture, and then on, to a pariah city, struck by deep poverty and malaise. It will also tell, not least by the nature of its striking new building, of a contemporary city in transition. Nearby there are also new office complexes, retail and leisure playgrounds, an arena and, soon, a new exhibition hall. The city it seems has come full circle, with transformed docklands that were, only twenty years ago, abandoned, silted up, useless, the most prominent symbol of our decline. Not that far away though, there is a different story. Half an hour’s walk from the new museum in any direction, you hit areas like Vauxhall, Kensington, and Toxteth, changed little by the regeneration of central Liverpool. These are districts, battered by the loss of industry and then by the subsequent break down of their community and way of life, where closed-down shops and pubs, and tinned-up streets of terraced houses, are a common sight. It is easy to highlight this stark difference, and many writers have. The same comparison could be made in varying degrees in Newcastle, Cardiff, Glasgow, Hull, Portsmouth, Salford and others. Regenerated waterfronts have been the symbolic centre of change for many cities over the last ten years, even if that hasn’t always led to opportunities for those living nearby. Yet, having protested about the gap between waterside regeneration and the continuing decay of our inner-urban communities, so many writers then stop. Satisfied in their telling of a ‘truth’, but rarely offering any real workable alternatives for these economically weak and battered cities beyond mocking their pretensions of having changed. Because what many refuse to face is that there is no easy answer to this, no simple solution to relieve this contrast. For someone living with regenerated docks a stones throw one direction and boarded-up terraces in the other, I see both sides of the story. There is a truth in the continued deprivation in such places, but there is also a truth that such developments are also a positive change, creating at least some jobs and growth in cities were, more often than not, nothing was built for years and decline often seemed terminal. The waterfront was the basis of Liverpool becoming a city, for years it became an embarrassment as it fell out of use, but now, it is has been made relevant again. A place where things happen and people want to visit. Historic buildings have been saved and brought back into use, new ones built. These developments will not on their own solve the myriad of problems of a city that suffers from poverty and deprivation, but they are better than continued rot and abandonment, which serves local people not at all, even if some aesthete critics would rather see poetic decay than imperfect growth. The brutal fact is the old industries and jobs are not coming back, at least not in the same way, and neither is the culture and way of life that went with them. And lest we forget, working on the waterfront in the old days was, for all the community spirit, often hard and unforgiving. Those who look back with nostalgia at that world are guilty of the same sentimentality as the writers of the past who claimed the industrial revolution had ‘corrupted’ the working class and romanticised about a ‘better’ rural world, ignoring the harshness of a life on the land. The industrialisation of Britain once destroyed a way of life just as surely as its de-industrialisation has now done in our time, but it also created a new, different one, in some ways better, in some ways worse. 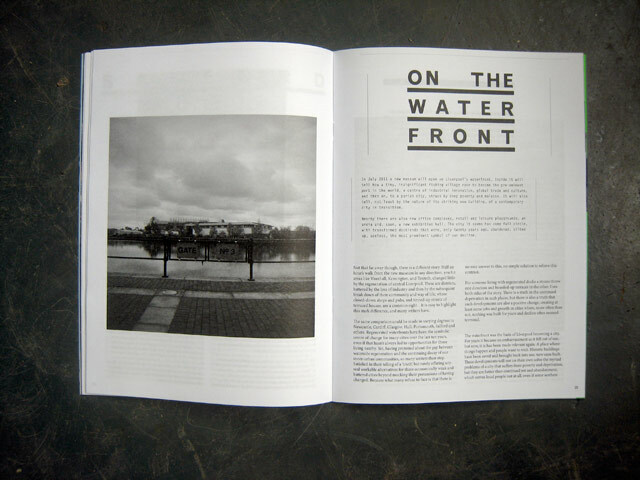 Our regenerated waterfronts represent the new reality that we are now entering. Cities ultimately must have a form of sustenance or they will not survive. Places like Liverpool have to go for whatever growth and jobs we can get and our biggest asset, undoubtedly, is the waterfront. The only alternatives are to be reliant on subsidy, which, as we are now seeing, is very easy to be taken away, or surrendering to terminal decline as our young people leave for better chances elsewhere. The key question is what next? The decline of the industrial waterfront set the rot in the communities that surrounded it. Now the post-industrial waterfront is re-growing, what, if anything, can be done for its neighborhoods to benefit? Despite the many problems such areas face, there are some examples of growth and, more importantly, of ground-up, community-led regeneration. By Liverpool’s old northern docks, on the site of an old sugar refinery is the Eldonian Village. An integrated sustainable development owned and organised by the community, one that has won the UK’s first United Nations World Habitat Award. Meanwhile, in Toxteth, near the old southern docks, an abandoned Victorian youth centre, ‘The Florrie’, has been taken over by local people and is being restored into a new multi-function community facility to open next year. With such self-organisation and self-determination under way, can these communities take a stake in these new economies? Will they, like the canny leaders of the Shetland Islands when the oil companies came to town in the 1970s, make sure that local people benefit from their geography, or will they instead be pushed out by economic growth, like in London, where the wealth of Canary Wharf built on the old east end docks does little help to the poor in Tower Hamlets. If such waterfront developments are to benefit the many not the few, communities will have to take matters into their own hands to make them, the profiteers in power are unlikely to acquiesce of their own accord. On the Mersey, the waterfront continues to re-grow. The huge Liverpool Waters and Wirral Waters schemes, by the company behind Salford’s MediaCity, promise vast new centres for living and working on the sites of old docks. There is new industrial development too, with plans for large new port terminals and distribution centres to serve the emerging economies and several renewable energy facilities, including possibly the UK’s first tidal energy barrage. I am a sceptic to all of this, but then I disbelieved the current crop of developments and yet here they are. Such attempts at growth by our old industrial cities may still ultimately be futile in the face of a world which is shifting rapidly, but for maybe the first time in thirty or forty years, Liverpool seems like it may just have a future, and its fate, and that of other cities like it, once again hangs on the waterfront. This piece appeared in Article magazine’s ‘Ports’ issue in June 2011.